The general cargo ship Hagland Boss ran aground off Langoya island in Holmestrandsfjorden, Norway. The vessel suffered mechanical problem and hardly stuck on rocky/mud shallow under the pressure of the winds and currents. The crew was unable to refloat by own power the ship and requested assistance from the local authorities. At the scene of the accident was dispatched tug, which towed the general cargo vessel and secured her at the anchorage. After refloating was ordered underwater survey, which estimated that the grounding caused sufficient damages of the rudder and propeller, which were out of order. 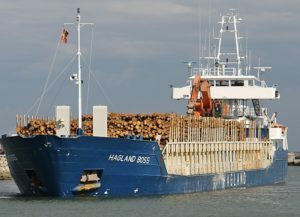 The owner of the general cargo ship Hagland Boss contracted salvage with tug Boa Sund, which started towing to Frederikshavn. The convoy proceeds with high speed of 6-8 kts, because of strong favorable wind. After repairs at the dock, the ship will be inspected for safety and seaworthiness. Fortunately the hull was not damaged and there were no oil leaks. There were no injured people and no water pollution during the accident. The local authorities started investigation for the circumstances and root cause of the grounding. The general cargo ship Hagland Boss (IMO: 9171058) has overall length 87.00 m, moulded beam of 12.00 m and maximumd raft of 4.10 m. The deadweight of the vessel is 3,694 DWT and the gross tonnage is 2,446 GRT. The general cargo ship Hagland Boss was built in 1997 by Slovenske Lodenice in Komarno, Slovakia.